Cadherins (named for "calcium-dependent adhesion") are a type of cell adhesion molecule (CAM) that is important in the formation of adherens junctions to bind cells with each other. Cadherins are a class of type-1 transmembrane proteins. They are dependent on calcium (Ca2+) ions to function, hence their name. Cell-cell adhesion is mediated by extracellular cadherin domains, whereas the intracellular cytoplasmic tail associates with a large number of adaptor and signaling proteins, collectively referred to as the cadherin adhesome. Cadherins are synthesized as polypeptides and undergo many post-translational modifications to become the proteins which mediate cell-cell adhesion and recognition. These polypeptides are approximately 720–750 amino acids long. Each cadherin has a small cytoplasmic component, a transmembrane component, and the remaining bulk of the protein is extra-cellular (outside the cell). The transmembrane component consists of single chain glycoprotein repeats. Because cadherins are Ca2+ dependent, they have five tandem extracellular domain repeats that act as the binding site for Ca2+ ions. Their extracellular domain interacts in two separate trans dimer conformations: strand-swap dimers (S-dimers) and X-dimers. To date, over 100 types of cadherins in humans have been identified and sequenced. The functionality of cadherins relies upon the formation of two identical subunits, known as homodimers. The homodimeric cadherins create cell-cell adhesion with cadherins present in the membranes of other cells through changing conformation from cis-dimers to trans-dimers. 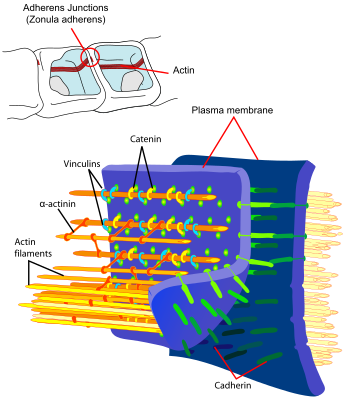 Once the cell-cell adhesion between cadherins present in the cell membranes of two different cells has formed, adherens junctions can then be made when protein complexes, usually composed of α-, β-, and γ-catenins, bind to the actin cytoskeleton portion of the cadherin. Cadherins behave as both receptors and ligands for other molecules. During development, their behavior assists in properly positioning cells: they are responsible for the separation of the different tissue layers, and for cellular migration. In the very early stages of development, E-cadherin (epithelial cadherin) is most greatly expressed. Many cadherins are specified for specific functions in the cell, and they are differentially expressed in a developing embryo. For example, during neurulation, when the neural plate is forming in the embryo, the tissues residing near the cranial neural folds have decreased N-cadherin expression. Conversely, the expression of the N-cadherins remains unchanged in the other regions of the neural tube that is located on the anterior-posterior axis of the vertebrate. The expression of the different types of cadherins in the cell are varying dependent upon the specific differentiation and specification of the organism during development. Cadherins play a vital role in the migration of cells through the epithelial-mesenchymal transition (EMT), which requires cadherins to forms adherents junctions with neighboring cells. In neural crest cells, which are transient cells that arise in the developing organism during gastrulation and function in the patterning of the vertebrate body plan, the cadherins are necessary to allow migration of cells to form tissues or organs. In addition, cadherins responsible in the EMT event in early development have also been shown to be critical in the reprogramming of specified adult cells into a pluripotent state, forming induced pluripotent stem cells (iPSCs). After development, cadherins play a role in maintaining cell and tissue structure, and in cellular movement. Regulation of cadherin expression can occur through promoter methylation among other epigenetic mechanisms. The E-cadherin–catenin complex plays a key role in cellular adhesion; loss of this function has been associated with greater tumour metastasis. CDH3 – P-cadherin (placental): P-cadherins are found in the placenta. ^ a b Alimperti, Stella; Andreadis, Stelios T. "CDH2 and CDH11 act as regulators of stem cell fate decisions". Stem Cell Research. 14 (3): 270–282. doi:10.1016/j.scr.2015.02.002. ^ Hulpiau P, van Roy F (February 2009). "Molecular evolution of the cadherin superfamily". Int. J. Biochem. Cell Biol. 41 (2): 349–69. doi:10.1016/j.biocel.2008.09.027. PMID 18848899. ^ Angst B, Marcozzi C, Magee A (February 2001). "The cadherin superfamily: diversity in form and function". J Cell Sci. 114 (Pt 4): 629–41. PMID 11171368. ^ Bello, S.M. ; Millo, H.; Rajebhosale, M.; Price, S.R. (2012). "Catenin-dependent cadherin function drives divisional segregation of spinal chord motor neurons". Journal of Neuroscience. 32 (2): 490–505. doi:10.1523/jneurosci.4382-11.2012. ^ Duguay, D.; A. Foty R., RA; S. Steinberg M., MS (2003). "Cadherin-mediated cell adhesion and tissue segregation: qualitative and quantitative determinants". Dev. Biol. 253 (2): 309–323. doi:10.1016/S0012-1606(02)00016-7. PMID 12645933. ^ Niessen, Carien M.; Gumbiner, Barry M. (2002). "Cadherin-mediated cell sorting not determined by binding or adhesion specificity". The Journal of Cell Biology. 156 (2): 389–399. doi:10.1083/jcb.200108040. PMC 2199232  . PMID 11790800. ^ Volk, T.; Cohen, O.; Geiger, B. (1987). "Formation of heterotypic adherens-type junctions between L-CAM containing liver cells and A-CAM containing lens cells". Cell. 50 (6): 987–994. doi:10.1016/0092-8674(87)90525-3. PMID 3621349. ^ Bayas, Marco V.; Leung, Andrew; Evans, Evan; Leckband, Deborah (2005). "Lifetime Measurements Reveal Kinetic Differences between Homophilic Cadherin Bonds". Biophysical Journal. 90 (4): 1385–95. doi:10.1529/biophysj.105.069583. PMC 1367289  . PMID 16326909. ^ Harris, T. J.; Tepass, U (2010). "Adherens junctions: From molecules to morphogenesis". Nature Reviews Molecular Cell Biology. 11 (7): 502–14. doi:10.1038/nrm2927. PMID 20571587. ^ a b c d Marie, Pierre J.; Haÿ, Eric; Modrowski, Dominique; Revollo, Leila; Mbalaviele, Gabriel; Civitelli, Roberto (2014-01-01). "Cadherin-Mediated Cell–Cell Adhesion and Signaling in the Skeleton". Calcified Tissue International. 94 (1): 46–54. doi:10.1007/s00223-013-9733-7. ISSN 0171-967X. PMC 4272239  . ^ a b Priest, Andrew Vae; Shafraz, Omer; Sivasankar, Sanjeevi. "Biophysical basis of cadherin mediated cell-cell adhesion". Experimental Cell Research. 358 (1): 10–13. doi:10.1016/j.yexcr.2017.03.015. ^ a b Tepass, U; Truong, K; Godt, D; Ikura, M; Peifer, M (2000). "Cadherins in embryonic and neural morphogenesis". Nature Reviews Molecular Cell Biology. 1 (2): 91–100. doi:10.1038/35040042. PMID 11253370. ^ Gumbiner, B. M. (2005). "Regulation of cadherin-mediated adhesion in morphogenesis". Nature Reviews Molecular Cell Biology. 6 (8): 622–34. doi:10.1038/nrm1699. PMID 16025097. ^ a b c Taneyhill, Lisa A.; Schiffmacher, Andrew T. (2017-06-01). "Should I stay or should I go? Cadherin function and regulation in the neural crest". genesis. 55 (6): n/a–n/a. doi:10.1002/dvg.23028. ISSN 1526-968X. ^ Reinhold, WC; Reimers, MA; Maunakea, AK; Kim, S; Lababidi, S; Scherf, U; Shankavaram, UT; Ziegler, MS; Stewart, C; Kouros-Mehr, Hosein; Cui, H; Dolginow, D; Scudiero, DA; Pommier, YG; Munroe, DJ; Feinberg, AP; Weinstein, JN (Feb 2007). "Detailed DNA methylation profiles of the E-cadherin promoter in the NCI-60 cancer cells". Molecular cancer therapeutics. 6 (2): 391–403. doi:10.1158/1535-7163.MCT-06-0609. PMID 17272646. ^ Beavon, IR (August 2000). "The E-cadherin-catenin complex in tumour metastasis: structure, function and regulation". European Journal of Cancer. 36 (13 Spec No): 1607–20. doi:10.1016/S0959-8049(00)00158-1. PMID 10959047. ^ a b Lodish, Harvey; Berk, Arnold; Kaiser, Chris; Krieger, Monte; Bretscher, Anthony; Ploegh, Hidde; Amon, Angelika (2013). Molecular Cell Biology (Seventh ed.). New York: Worth Publ. p. 934. ISBN 978-1-4292-3413-9. Beavon IR (2000). "The E-cadherin-catenin complex in tumour metastasis: structure, function and regulation". Eur. J. Cancer. 36 (13 Spec No): 1607–20. doi:10.1016/S0959-8049(00)00158-1. PMID 10959047. Berx G, Becker KF, Höfler H, van Roy F (1998). "Mutations of the human E-cadherin (CDH1) gene". Hum. Mutat. 12 (4): 226–37. doi:10.1002/(SICI)1098-1004(1998)12:4<226::AID-HUMU2>3.0.CO;2-D. PMID 9744472. Bryant DM, Stow JL (2005). "The ins and outs of E-cadherin trafficking". Trends Cell Biol. 14 (8): 427–34. doi:10.1016/j.tcb.2004.07.007. PMID 15308209. Chun YS, Lindor NM, Smyrk TC, et al. (2001). "Germline E-cadherin gene mutations: is prophylactic total gastrectomy indicated?". Cancer. 92 (1): 181–7. doi:10.1002/1097-0142(20010701)92:1<181::AID-CNCR1307>3.0.CO;2-J. PMID 11443625. Hazan RB, Qiao R, Keren R, et al. (2004). "Cadherin switch in tumor progression". Ann. N. Y. Acad. Sci. 1014 (1): 155–63. doi:10.1196/annals.1294.016. PMID 15153430. Moran CJ, Joyce M, McAnena OJ (2005). "CDH1 associated gastric cancer: a report of a family and review of the literature". Eur J Surg Oncol. 31 (3): 259–64. doi:10.1016/j.ejso.2004.12.010. PMID 15780560. Reynolds AB, Carnahan RH (2005). "Regulation of cadherin stability and turnover by p120ctn: implications in disease and cancer". Semin. Cell Dev. Biol. 15 (6): 657–63. doi:10.1016/j.semcdb.2004.09.003. PMID 15561585. Wijnhoven BP, Dinjens WN, Pignatelli M (2000). "E-cadherin-catenin cell-cell adhesion complex and human cancer". The British journal of surgery. 87 (8): 992–1005. doi:10.1046/j.1365-2168.2000.01513.x. PMID 10931041. Renaud-Young M, Gallin WJ (2002). "In the first extracellular domain of E-cadherin, heterophilic interactions, but not the conserved His-Ala-Val motif, are required for adhesion". Journal of Biological Chemistry. 277 (42): 39609–39616. doi:10.1074/jbc.M201256200. PMID 12154084. Cadherins are a group of transmembrane proteins that serve as the major adhesion molecules located within adherens junctions. They can regulate cell-cell adhesion through their extracellular domain and their cytosolic domains connect to the actin cytoskeleton by binding to catenins [PUBMED:25014356]. They may play an important role in the sorting of different cell types during morphogenesis, histogenesis and regeneration. They may also be involved in the regulation of tight and gap junctions, and in the control of intercellular spacing. Cadherins are evolutionary related to the desmogleins which are component of intercellular desmosome junctions involved in the interaction of plaque proteins. Structurally, cadherins comprise a number of domains: classically, these include a signal sequence; a propeptide of around 130 residues; a single transmembrane domain and five tandemly repeated extracellular cadherin domains, 4 of which are cadherin repeats, and the fifth contains 4 conserved cysteines and a N-terminal cytoplasmic domain [PUBMED:11736639]. However, proteins are designated as members of the broadly defined cadherin family if they have one or more cadherin repeats. A cadherin repeat is an independently folding sequence of approximately 110 amino acids that contains motifs with the conserved sequences DRE, DXNDNAPXF, and DXD. Crystal structures have revealed that multiple cadherin domains form Ca2+-dependent rod-like structures with a conserved Ca2+-binding pocket at the domain-domain interface. Cadherins depend on calcium for their function: calcium ions bind to specific residues in each cadherin repeat to ensure its proper folding, to confer rigidity upon the extracellular domain and is essential for cadherin adhesive function and for protection against protease digestion. For those sequences which have a structure in the Protein DataBank, we use the mapping between UniProt, PDB and Pfam coordinate systems from the PDBe group, to allow us to map Pfam domains onto UniProt sequences and three-dimensional protein structures. The table below shows the structures on which the Cadherin domain has been found. There are 498 instances of this domain found in the PDB. Note that there may be multiple copies of the domain in a single PDB structure, since many structures contain multiple copies of the same protein sequence.